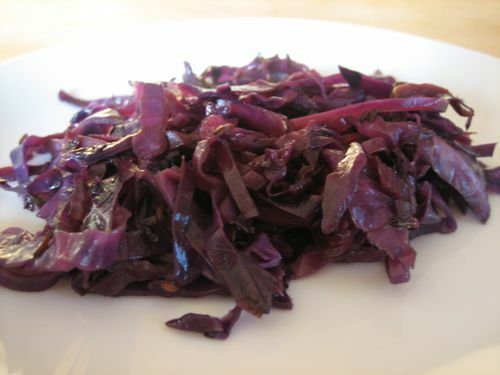 Caraway seeds and a splash of vinegar make sharp and colorful red cabbage a delicious and beautiful addition to any fall or winter meal. Note: Use unseasoned rice wine vinegar (the "seasoned" kind has added salt and sugar) in this recipe or another mild vinegar, such as cider vinegar. Pull off and discard the outer leaves of the cabbage. Using a sharp knife, cut the cabbage in half lengthwise (through ​the core). Cut out and discard the core. Lay the cabbage cut-side down and slice it as thinly as possible (you can also use a mandoline if you have one handy). Set the cabbage aside. In a large sauté pan or medium pot, heat the oil and caraway seeds over medium-high heat until the seeds sizzle. Add the cabbage and salt. Cook, stirring, to combine everything. Cover and reduce the heat to medium-low. Cook, stirring occasionally, until the cabbage is wilted and tender to the bite, about 15 minutes. Feel free to cook the cabbage longer - up to 30 minutes - if you want it extra-tender. Sprinkle the cabbage with vinegar. Taste and add more salt and vinegar, if you like. Serve the cabbage hot or warm.